Lock in a great price for JW Marriott Hotel Sanya Dadonghai Bay – rated 8.7 by recent guests! The breakfast was good. It did not vary that much the three times we tried it but we liked they wide assortment. Lots of fresh food. The room was big and had a great view over the ocean from the 10th floor. The staff was friendly and using Google translate it was easy to communicate with any of them. They have a shuttle bus service that starts and 11 AM and then comes for every 2 hours until 7 PM. 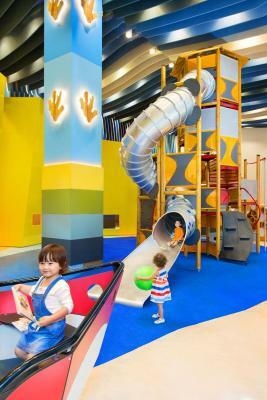 It has two stops: one close to the nearby beach and one next to a shopping mall in the city center. You should remember to book a seat on the shuttle a few hours before to make sure that it has room for you. This was a beautiful hotel. Our room was spacious with a balcony that looked out over the bay. The breakfast buffet was extensive and delicious. The beach next to the hotel was rocky, but the lovely sandy beach was a 5 minute walk along a paved path that turned into a boardwalk with shops and cafes. Overall: great stay and value for money 5-star hotel. Beautiful huge pool and garden with enough seats for you to relax the entire day. 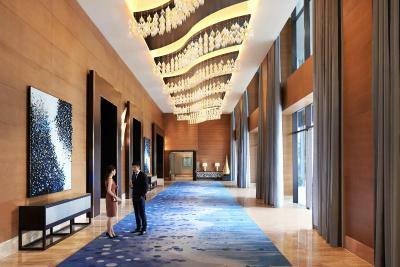 Massive stylish lobby. Spacious rooms with big balcony. Breakfast serves Chinese as well as Western. 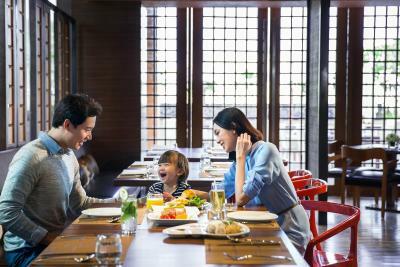 An amazing tasty and large breakfast buffet for asian and european taste. Excellent Espresso and tea of course. The pool went round the corner, therefore you could swim more than 100m if you like without a turn. Must have been more than 100metres ;-). 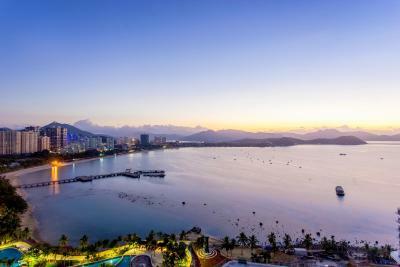 If are ready to walk 5 minutes you can enjoy the Dadonghai beach. Top and not too crowded. The beach directly at the hotel was not to my likes at all. The view over Dadonghai Bay from the balcony contributed to our relaxation. Last but not least important for me: Wooden floors in the room, not laid out with carpets. Restaurants in walkig distance. 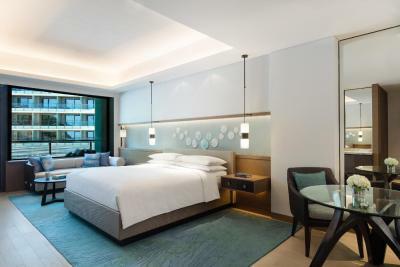 If you are ready to spend the extra money: The hotel features Cantonese cuisine (and others) which you hardly get downtown. Sorry to forget the name of the chef. Excellent room and pools. Food was good but breakfast was very Chinese. Really good breakfast, beachfront with tons of dining options, nice views, great pool. Visiting form Australia, we loved dealing with employee Wit Wong. He made our stay really great as he spoke English perfectly and couldn’t have been more helpful. 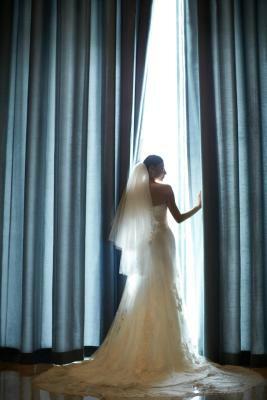 The service and the facilities were excellent. We appreciated the help of the manager Will during our stay. 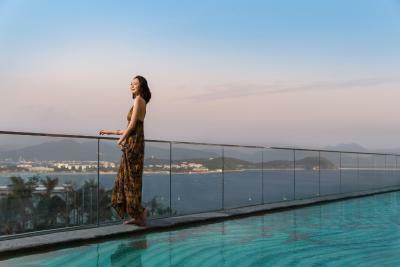 One of our top picks in Sanya.JW Marriott Hotel Sanya Dadonghai Bay is located at the base of the Luhuitou Mountain and embraced by luxuriant tropical gardens, an ocean-facing grass lawn and located adjacent to a nationally protected natural coral reef. The property features stunning ocean and lush mountain views all around. 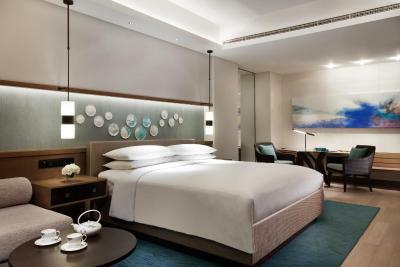 JW Marriott Hotel Sanya Dadonghai Bay is a five minutes’ drive from downtown Sanya, 20 minutes from Sanya Railway Station and 35 minutes from Sanya Phenix Airport by car. 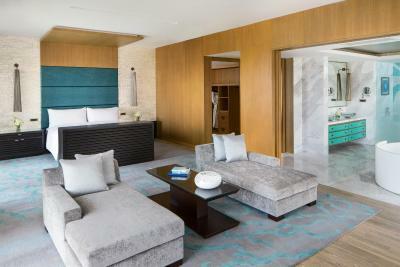 The spacious rooms at JW Marriott Sanya Dadonghai Bay come with beautiful views of the garden. 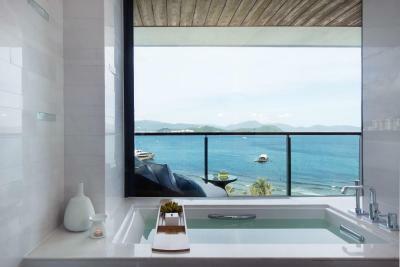 Some rooms also features sea views or mountain views. 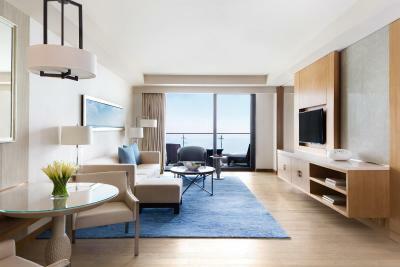 Rooms are equipped with a seating area with sofa, safety deposit box, a satellite TV and mini-bar. 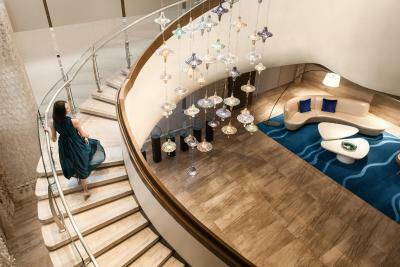 The hotel features an array of facilities including a 24-hour gym and Spa by JW. 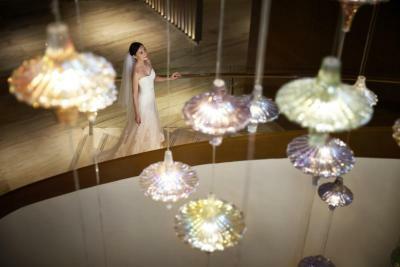 JW Marriott Hotel Sanya Dadonghai Bay offers the venue for events including 9 function rooms and a completely transparent Wedding Chapel on ocean-facing beach lawn. Authentic cuisines are served at the 3 on-site restaurants. 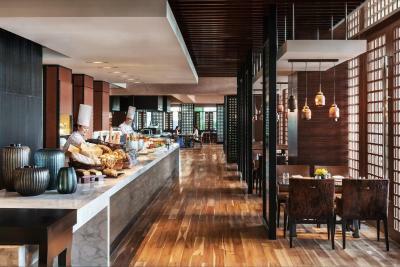 JW Kitchen is an all-day dining venue that features authentic local flavors as well as a internationally favored buffet with live cooking stations. 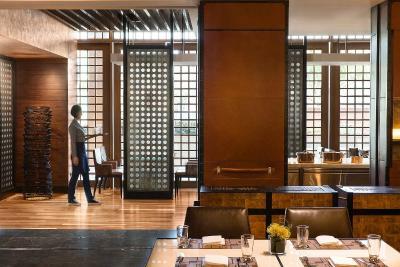 Guests may also indulge in local and regional flavors at the property’s dedicated Chinese and Korean restaurants. 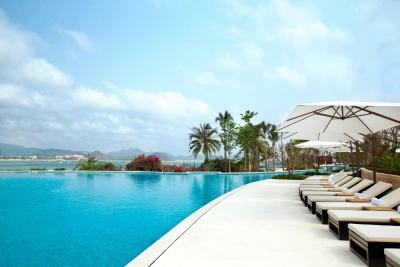 When would you like to stay at JW Marriott Hotel Sanya Dadonghai Bay? 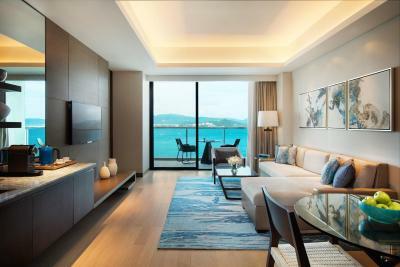 This spacious 108-square-yard suite features a balcony with sea view, soundproofing and sofa. 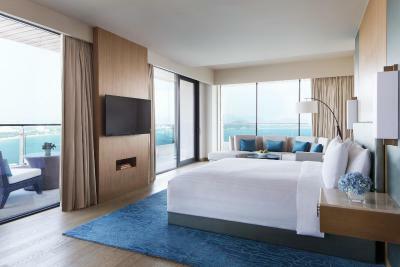 Located on floors 3-9, this twin/double room has a satellite TV, sofa and a balcony with sea view at 50-90 degrees angle. This twin/double room has a seating area, hot tub and electric kettle. Mountain view can be enjoyed through the large window. 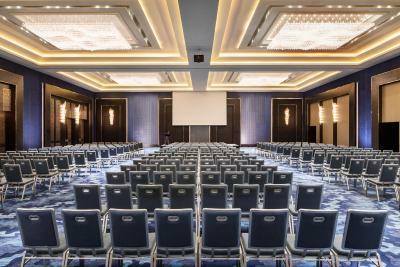 Located on floors 8-16, this twin/double room features air conditioning, seating area and a balcony with sea view at 90-180 degrees angle. This double room features a balcony with sea view, sofa and soundproofing. 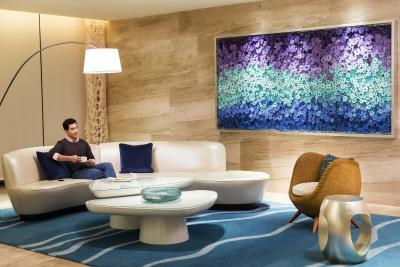 Guests can enjoy executive benefits. This twin/double room has a balcony with garden view, seating area and air conditioning. 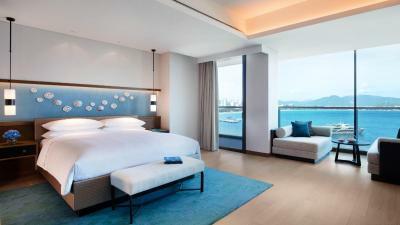 Guests can enjoy CNY 275 consumption per night. 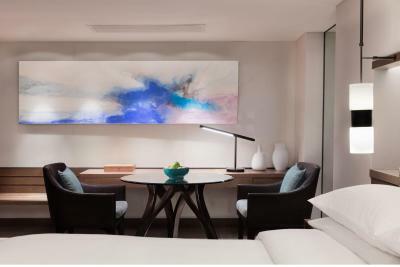 Guests can enjoy set lunch (Hainan chicken rice or Baoluo noodles) for 2 people once per stay. This twin/double room has a bathrobe, air conditioning and soundproofing. - afternoon tea for 2 guests once. This twin/double room has a balcony, hot tub and mini-bar. This twin/double room has a balcony, air conditioning and hot tub. 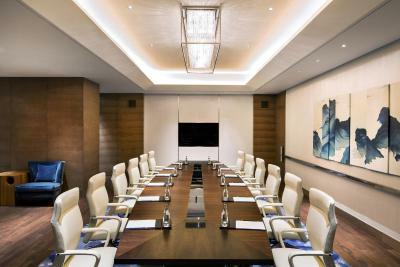 Please note that the offer dose not apply to groups of 10 rooms or more. WiFi is available in the hotel rooms and costs CNY 80 per 24 hours. 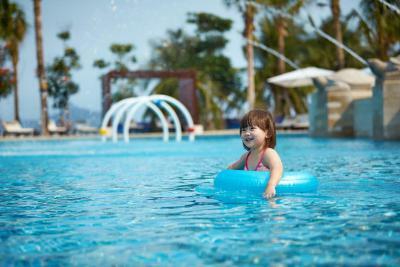 House Rules JW Marriott Hotel Sanya Dadonghai Bay takes special requests – add in the next step! 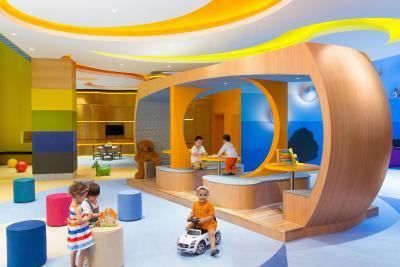 Any additional older children or adults are charged CNY 480 per night for extra beds. 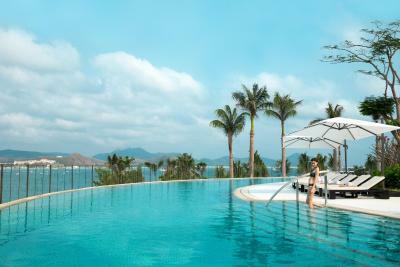 JW Marriott Hotel Sanya Dadonghai Bay accepts these cards and reserves the right to temporarily hold an amount prior to arrival. The property provides free shuttle bus service between from hotel to city center. Please contact the hotel for the schedule. Contact details can be found on your booking confirmation. Please note that any type of extra bed or crib is upon request and needs to be confirmed by the management. Please note that for breakfast included rate, room rate only includes breakfast for adults. Extra charges apply for children's breakfast. Children who are under 6 years old can enjoy breakfast for free. Children aged 6-12 can have breakfast at a discounted price. For more details please contact the hotel. Please note that prices for extra bed and breakfast will differ during Spring Festivals. For more details please contact the property directly with the contact details provided in your confirmation. The booking I made on booking.com did not get registered it their system so they were not able to confirm it. Not sure if Booking.com mistake or if it was JW Marriotts mistake. Either way they handled it pretty well. They upgraded our room from an Ocean room to a premier ocean room. They need more staff who speaks English. I like the property location. Some of the staff did not understand English, but Google translated helped us communicate. For a 5-star hotel not all staff were as professional. Room clean enough, but some forgotten spots though. The hotel is in a dead end street and as such waiting for the taxi took us very long. The food in the hotel and bar is not good at all. Actually it is such a great hotel that the food does not fit the rest and I was truly surprised about it. So next day I ordered again but that was even worse, both my occasions it was not nice or good food at all. So skip the food drink a beer or wine and enjoy the rest. - breakfast in the morning was super crowded and there were not alot of choices. - opted for 1 large bed but given twin bed instead (im traveling alone). during check in, the staff kept asking for proof of request, saying there was no request from booking.com for 1 large bed so at the end they proceed with twin bed for me. when i reached the room and called the front desk again to tell them i’ve found the request proof, all they said was come to front desk tomorrow and show us and we’ll see if we can change you to one bed room if its available. very bad way of handling as there were no apologizing until i mentioned them. staff is not well trained! 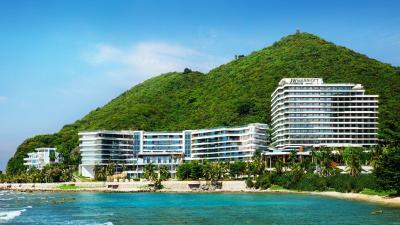 I always go to Sanya in the middle of the Chinese winter. Around about the time that you haven't seen your feet or even you arms for a couple of months because of the cold, So when you touchdown at Sanya airport and disembark the plane, you can actually feel your feet expand from the heat and you even begin to sweat for the first time in a couple of months. My first advice is to get your sunnies ready, buy some water and then go to the organized taxi stand. (there are plenty of taxi hacks on the just outside the terminal). The taxi will take about an hour to get to the hotel in difficult traffic. Make sure you have the name of the hotel in Chinese to show the taxi driver and that the taxi driver uses the meter. Anyway, after a dehydrating 1 hour taxi ride to the hotel I arrived at the hotel. Checkin was a breeze. They actually through rose petals in front of me as I entered the hotel. They then sat me down, put my feet on a stool, removed my shoes and began to massage my feet. At the same time as the foot massage I was being fed grapes. All I could think of at that moment is I wish that this checkin would last forever. Unfortunately, it was one of the shortest checkins that I have ever had. I was soon whisked off to my room and left to fend for myself for 8 days. In short, Wifi is the fastest I have had in a Chinese hotel. The breakfast was as much as you can reasonably eat without making a total pig of yourself. The view from the balcony was breathtaking. 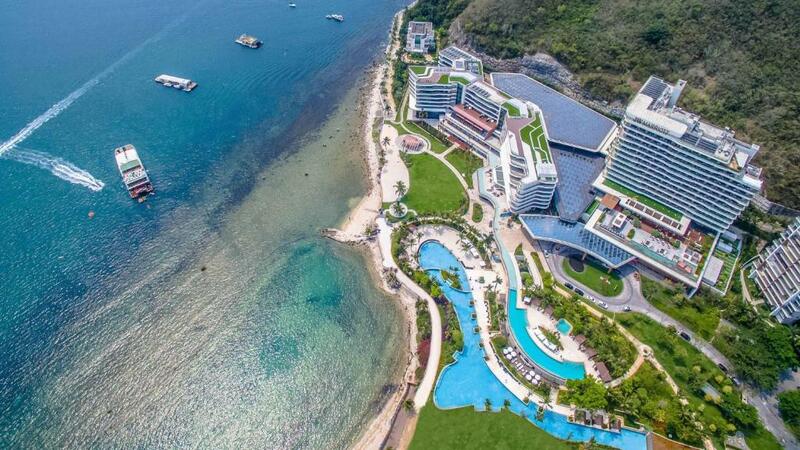 The hotel's surroundings were amazing, from the hotel grounds themselves - so well taken care of to the closeness of the swimmable beach - maybe 5 minutes walk from the hotel to the outdoor restaurants on your way to the beach. Now getting into town took me maybe a 10 minute walk straight (and I mean straight) out of the hotel. There was no way in the world that you can get lost. Within the town there are a couple of supermarkets and a few upgraded restaurants that I didn't visit. The pool was closed and there were ongoing renovations! However Autograph offered nice pools! The breakfast, classy ambiance the service. Manager Will is to be commended for his willingness to help guests!